Tsewang Paljor (Tib. ་ཚེ་དབང་དཔལ་འབྱོར་, Wyl. tshe dbang dpal 'byor) (1909-1999) — Jamyang Khyentse Chökyi Lodrö's private secretary. Mayum Tsering Wangmo's second husband, and the father of the Seventh Dzogchen Rinpoche. When his father, Tsewang Paljor, passed away in the spring of 1999, Sogyal Rinpoche requested Orgyen Tobgyal Rinpoche to write a tribute to his achievements and to his extraordinary life. Tsewang Paljor’s lifetime spanned the whole of the twentieth century, and his work for the Dharma and his master Jamyang Khyentse Chökyi Lodrö brought him in contact with the greatest Tibetan masters of the age. This tribute was published in the Tibetan language magazine Nyenchen Thanglha. 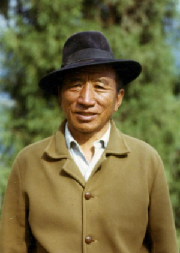 The translation, by Rigpa Translations, first appeared in Dzogchen News, the newsletter published by Dzogchen monastery, and as a small booklet called Tsewang Paljor (1909-1999) A Tribute to a Remarkable Life. ↑ The anniversary of Tsewang Paljor is celebrated on the 19th day of the 2nd month of the Tibetan lunar calendar. This page was last edited on 16 January 2019, at 20:27.